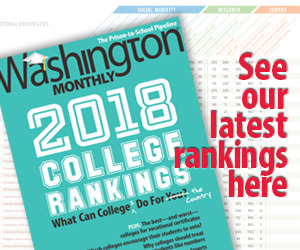 Washington Monthly | Fake News or Fake Policies? Fake News or Fake Policies? Gullible Trump supporters may fall for the ‘fake news’ meme, but the real issue with this White House—fake policies—is based on falsehoods and misdirection. President Trump hurls the epithet “fake news” at the media virtually daily for reporting truths that he cannot bear. But this is merely a tactic to cast attention away from his fake policies, built on a foundation of lies and presidential decrees. “Obamacare covers very few people — and remember, deduct from the number all of the people that had great health care that they loved that was taken away from them — it was taken away from them,” Trump touted in February. In fact, the Times points out, the ACA increased health insurance coverage to some 20 million Americans. “NATO, obsolete, because it doesn’t cover terrorism,” Trump claimed in March. Wrong—NATO has been fighting terrorism since the 1980s. The president of the United States told at least one untruth a day in the first 40 days of his tenure, and they keep on coming. Even the Boy Scouts got an earful last week at their national jamboree in West Virginia. “The FAKE NEWS media (failing @nytimes, @NBCNews, @ABC, @CBS, @CNN) is not my enemy, it is the enemy of the American People!” the president tweeted in February. The “fake news” meme may hold sway among gullible Trumpist dead-enders, but the real issue with this White House—fake policies—is based on falsehoods and misdirection. In six months as president, Donald Trump has failed to pass any significant legislation. Instead, he has signed a flurry of executive actions ranging from “Scrapping the Trans-Pacific Partnership” to “Reviewing Designations of National Monuments.” His tax plan is a skeletal single-page, 250-word outline. These are not substitutes for actual legislation, and neither are tweets. All are a cheap approach toward policy, establishing no congressionally funded programs, decrees that are easily reversible after he leaves office. Repealing and replacing Obamacare keeps hitting the brick wall of reality in Congress. And as the GOP spins its wheels desperately trying to cancel health insurance for up to 32 million Americans, much-needed legislation on infrastructure, tax reform and other crying needs languishes. Trump campaigned on truth-lite slogans and grudges, not on any cohesive body of policy issues. If the Trump domestic agenda is a mess, foreign policy is little more than a hodge-podge of fluid positions untethered to an overall strategy. More fake policies. Yes, the administration is taking a hard line on North Korea, Iran, Cuba and Venezuela and is cracking down on immigration. And Trump’s “America First” philosophy—borrowed whole cloth from the eponymous isolationist movement of the 1930s—comes down against liberal trade and transnational alliances. But there’s no clearly defined policy umbrella covering national security. This is normally accomplished through policy reviews done by the White House, followed by the departments of State, Defense and Homeland Security. There is no White House-issued National Security Strategy (NSS), mandated by Congress since 1986 to outline the government’s key foreign policy, defense and intelligence interests and goals. Nor has the Department of State issued its follow-on to the NSS—called the Quadrennial Diplomacy and Development Review—putting forth its foreign policy goals. Under the capable leadership of Secretary James Mattis, the Pentagon is working on its National Defense Strategy, also congressionally mandated, which lays out the nation’s defense goals and strategy. But how Mattis, et al. will accomplish this within a dystopian administration is anybody’s guess. This lack of a defined and coherent national security vision lends itself to reactive seat-of-the-pants approach to global challenges, an a la carte way of dealing with issues. The missile attack on Syria is an example. Lacking an overarching strategy, the administration’s professions of “making America great again” in the world come off as at least hollow, if not also fake. So, the Trump administration lurches from shaky position to nebulous policy depending on the day’s dose of presidential tweets and ad hoc rants. One day China is a currency manipulator. The next day it is not. NATO is obsolete, then it’s not. Candidate Trump opposed intervention in Syria, while President Trump launched missiles against it. Meanwhile, whole rows of executive office spaces are devoid of senior officials at State and DoD as the White House drags its feet on filling positions. Without those top officials, policy doesn’t get done. Perhaps that is for the better. Trump’s tried and true way of dealing with unpleasant truths uncovered by a dynamic press is to shoot the messenger. His constant smearing of the fourth estate diverts attention from his fake policies. A track record over time of policy inaction, however, will reveal the president for what he is, even to his supporters: a fraud. “I don’t like to analyze myself because I might not like what I see,” Donald Trump confessed to one of his biographers, Michael D’Antonio. A rare truthful confession from the now commander-in-chief. What he might see is a failed president, hounded from office, possibly before his term is up. Fake policies cannot outrun the truth.